Urban agriculture in developing countries contributes to food diversity and security of the urban population. Its importance will increase in the future because of fast-growing urbanization. 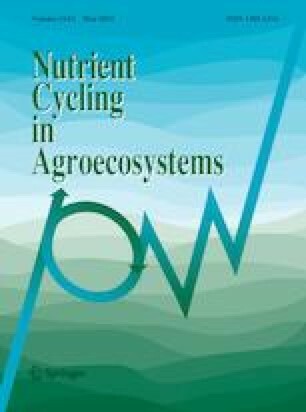 Little is known about nutrient fluxes and balances of these high input agricultural systems, which are characterized by high fertilizer use, often combined with wastewater irrigation. Adding biochar to soil has shown the potential to decrease nutrient leaching, increase yields and nutrient use efficiency. Therefore, we installed lysimeters in a multi-factorial field experimental in Tamale, Northern Ghana. The treatments included a control (no amendments applied), biochar at 20 t ha−1, mineral fertilization according to the farmers’ practice and a combination of biochar amendment and fertilization. All treatments were irrigated with tap water or wastewater. The results show higher water losses under wastewater irrigation (+ 33%). The addition of biochar had no effects on nutrient leaching, balances or water flux. Leaching losses of nitrogen were around 200 kg N ha−1 when irrigation exceeded the crop demands. When irrigation was more appropriate, the leaching rates were 50–100 kg N ha−1. The leaching of Mg and Ca almost doubled in some seasons and negative mass balances under mineral fertilization entailed soil acidification. Nitrogen balances varied strongly depending on the season, irrigation water qualities or fertilization (− 50 to 222 kg NO3-N ha−1). We conclude that the high nutrient load associated with the commonly-practiced wastewater irrigation entails large leaching losses. These cannot be curbed by biochar application and should be accounted for in fertilizer management in urban vegetable production. The online version of this article ( https://doi.org/10.1007/s10705-019-09989-w) contains supplementary material, which is available to authorized users. We thank the German Federal Ministry of Education and Research (BMBF) and the German Federal Ministry for Economic Cooperation and Development (BMZ) for funding the research of the UrbanFoodPlus project under the GlobE-initiative (FKZ: 031A242-A,B). We also thank Sabine Frölich, Katja Gonschorek, Heidrun Kerkhoff and Bettina Röhm at Ruhr-Universität Bochum for technical support. We also acknowledge the help of our field technicians Isaac K. Asirifi and Isaac Asirifi, supporting farmers and the University for Development Studies (UDS) in Tamale for their effective support.